By John F. McKenna (McJack): World Boxing Organization (WBO) welterweight champion Manny Pacquiao (54-3-2, 38 KO’s) is now in a position that he can push Top Rank CEO Bob Arum to make the fight with WBC welterweight champion Floyd Mayweather Jr. (42-0, 25 KO’s) happen. The dynamics of making the long sought match between Pound for Pound king Pacquiao and the undefeated Mayweather has changed significantly since Pacquiao’s controversial win on November 12 over WBO/WBA lightweight champion Juan Manuel Marquez (54-6-1, 39 KO’s. Before Manny’s fight with Marquez many boxing observers were questioning whether Mayweather really wanted to take on the Filipino icon. Floyd is very protective of his 42-0 record and the feeling by many was that he was unwilling to take the risk of engaging Pacquiao. But Pacquiao struggled in his fight with Marquez and a majority of boxing fans feel that he did not deserve the decision. Mayweather on the other hand cruised to an easy one sided win over Marquez in 2009. The perception of many boxing fans changed based on Manny’s sub par performance against Marquez. 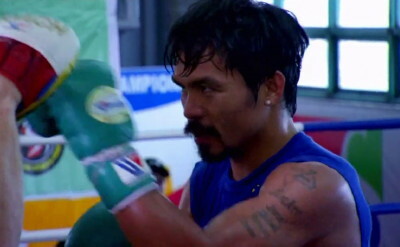 Going into the fight the betting odds favoring Pacquiao were as high as 10 to 1. After a couple of rounds however, it was clear that Pacquiao despite all his improvements was still baffled by Marquez’s defensive and counter punching skills. The reasoning is that Mayweather has no peer in the two areas which give Manny the most problems. Shortly after the conclusion of the Pacquiao – Marquez fight the Mayweather camp showed an interest in making the fight with Pacquiao. Top Rank CEO Bob Arum on the other hand who had long expressed a desire to promote such a fight changed his stance and indicated that he wanted to pursue a 4th fight with Marquez. It has been rumored that Pacquiao and trainer Freddie Roach and conditioning coach Alex Ariza would like to see the Mayweather fight happen. Manny is now in the position that he needs to not only state his preference to Arum but to insist that he wants to make Floyd Mayweather Jr. his next opponent. The likelihood of the Mega fight between Pacquiao and Mayweather being arranged is now at the highest point it has ever been. The ball is in Manny Pacquiao’s court.